For other uses, see Castor and Pollux (disambiguation). Their mother was Leda, but they had different fathers; Castor was the mortal son of Tyndareus, the king of Sparta, while Pollux was the divine son of Zeus, who seduced Leda in the guise of a swan. Though accounts of their birth are varied, they are sometimes said to have been born from an egg, along with their twin sisters Helen of Troy and Clytemnestra. In Latin the twins are also known as the Gemini[e] (literally "twins") or Castores,[f] as well as the Tyndaridae[g] or Tyndarids. [h] When Castor was killed, Pollux asked Zeus to let him share his own immortality with his twin to keep them together, and they were transformed into the constellation Gemini. The pair were regarded as the patrons of sailors, to whom they appeared as St. Elmo's fire. They were also associated with horsemanship, due to the idea that they rode the 'white horses' of foam that were formed by curling ocean waves. There is much contradictory information regarding the parentage of the Dioscuri. In the Homeric Odyssey (11.298-304), they are the sons of Tyndareus alone, but they were sons of Zeus in the Hesiodic Catalogue (fr. 24 M-W). The conventional account (attested first in Pindar, Nemean 10) combined these paternities so that only Pollux was fathered by Zeus, while Leda and her husband Tyndareus conceived Castor. This explains why they were granted an alternate immortality. The figure of Tyndareus may have entered their tradition to explain their archaic name Tindaridai in Spartan inscriptions, or Tyndaridai in literature, in turn occasioning incompatible accounts of their parentage. Their other sisters were Timandra, Phoebe, and Philonoe. Castor and Pollux are sometimes both mortal, sometimes both divine. One consistent point is that if only one of them is immortal, it is Pollux. In Homer's Iliad, Helen looks down from the walls of Troy and wonders why she does not see her brothers among the Achaeans. The narrator remarks that they are both already dead and buried back in their homeland of Lacedaemon, thus suggesting that at least in some early traditions, both were mortal. Their death and shared immortality offered by Zeus was material of the lost Cypria in the Epic cycle. The Dioscuri were regarded as helpers of humankind and held to be patrons of travellers and of sailors in particular, who invoked them to seek favourable winds. Their role as horsemen and boxers also led to them being regarded as the patrons of athletes and athletic contests. They characteristically intervened at the moment of crisis, aiding those who honoured or trusted them. Ancient Greek authors tell a number of versions of the story of Castor and Pollux. Homer portrays them initially as ordinary mortals, treating them as dead in the Iliad ("... there are two commanders I do not see, / Castor the horse breaker and the boxer / Polydeuces, my brothers ..." – Helen, Iliad 3.253–255), but in the Odyssey they are treated as alive even though "the corn-bearing earth holds them". The author describes them as "having honour equal to gods", living on alternate days because of the intervention of Zeus. In both the Odyssey and in Hesiod, they are described as the sons of Tyndareus and Leda. In Pindar, Pollux is the son of Zeus while Castor is the son of the mortal Tyndareus. The theme of ambiguous parentage is not unique to Castor and Pollux; similar characterisations appear in the stories of Hercules and Theseus. The Dioscuri are also invoked in Alcaeus' Fragment 34a, though whether this poem antedates the Homeric Hymn to the twins is unknown. They appear together in two plays by Euripides, Helen and Elektra. Cicero tells the story of how Simonides of Ceos was rebuked by Scopas, his patron, for devoting too much space to praising Castor and Pollux in an ode celebrating Scopas' victory in a chariot race. Shortly afterwards, Simonides was told that two young men wished to speak to him; after he had left the banqueting room, the roof fell in and crushed Scopas and his guests. Both Dioscuri were excellent horsemen and hunters who participated in the hunting of the Calydonian Boar and later joined the crew of Jason's ship, the Argo. During the expedition of the Argonauts, Pollux took part in a boxing contest and defeated King Amycus of the Bebryces, a savage mythical people in Bithynia. After returning from the voyage, the Dioscuri helped Jason and Peleus to destroy the city of Iolcus in revenge for the treachery of its king Pelias. When their sister Helen was abducted by Theseus, the half-brothers invaded his kingdom of Attica to rescue her. In revenge they abducted Theseus's mother Aethra and took her to Sparta while setting his rival, Menestheus, on the throne of Athens. Aethra was then forced to become Helen's slave. She was ultimately returned to her home by her grandsons Demophon and Acamas after the fall of Troy. 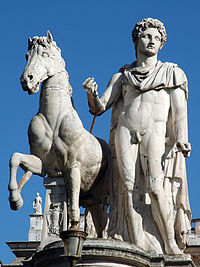 Castor and Pollux aspired to marry the Leucippides ("daughters of the white horse"), Phoebe and Hilaeira, whose father was a brother of Leucippus ("white horse"). [i] Both women were already betrothed to cousins of the Dioscuri, the twin brothers Lynceus and Idas of Thebes, sons of Tyndareus's brother Aphareus. Castor and Pollux carried the women off to Sparta wherein each had a son; Phoebe bore Mnesileos to Pollux and Hilaeira bore Anogon to Castor. This began a family feud among the four sons of the brothers Tyndareus and Aphareus. The cousins carried out a cattle-raid in Arcadia together but fell out over the division of the meat. After stealing the herd, but before dividing it, the cousins butchered, quartered, and roasted a calf. As they prepared to eat, the gigantic Idas suggested that the herd be divided into two parts instead of four, based on which pair of cousins finished their meal first. Castor and Pollux agreed. Idas quickly ate both his portion and Lynceus' portion. Castor and Pollux had been duped. They allowed their cousins to take the entire herd, but vowed to someday take revenge. Some time later, Idas and Lynceus visited their uncle's home in Sparta. The uncle was on his way to Crete, so he left Helen in charge of entertaining the guests, which included both sets of cousins, as well as Paris, prince of Troy. Castor and Pollux recognized the opportunity to exact revenge, made an excuse that justified leaving the feast, and set out to steal their cousins' herd. Idas and Lynceus eventually set out for home, leaving Helen alone with Paris, who then kidnapped her. Thus, the four cousins helped set into motion the events that gave rise to the Trojan War. Meanwhile, Castor and Pollux had reached their destination. Castor climbed a tree to keep a watch as Pollux began to free the cattle. Far away, Idas and Lynceus approached. Lynceus, named for the lynx because he could see in the dark, spied Castor hiding in the tree. Idas and Lynceus immediately understood what was happening. Idas, furious, ambushed Castor, fatally wounding him with a blow from his spear—but not before Castor called out to warn Pollux. In the ensuing brawl, Pollux killed Lynceus. As Idas was about to kill Pollux, Zeus, who had been watching from Mt. Olympus, hurled a thunderbolt, killing Idas and saving his son. 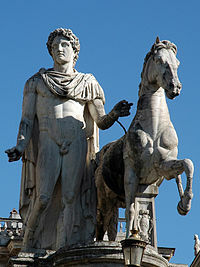 Castor and Pollux are consistently associated with horses in art and literature. They are widely depicted as helmeted horsemen carrying spears. The Pseudo-Oppian manuscript depicts the brothers hunting, both on horseback and on foot. On votive reliefs they are depicted with a variety of symbols representing the concept of twinhood, such as the dokana (δόκανα – two upright pieces of wood connected by two cross-beams), a pair of amphorae, a pair of shields, or a pair of snakes. They are also often shown wearing felt caps, sometimes with stars above. They are depicted on metopes from Delphi showing them on the voyage of the Argo (Ἀργώ) and rustling cattle with Idas. Greek vases regularly show them capturing Phoebe and Hilaeira, as Argonauts, as well as in religious ceremonies and at the delivery to Leda of the egg containing Helen. They can be recognized in some vase-paintings by the skull-cap they wear, the pilos (πῖλος), which was already explained in antiquity as the remnants of the egg from which they hatched. They were described by Dares Phrygius as "... blond haired, large eyed, fair complexioned, and wellbuilt with trim bodies". The Dioskouroi were worshipped by the Greeks and Romans alike; there were temples to the twins in Athens, such as the Anakeion, and Rome, as well as shrines in many other locations in the ancient world. The Dioskouroi and their sisters grew up in Sparta, in the royal household of Tyndareus; they were particularly important to the Spartans, who associated them with the Spartan tradition of dual kingship and appreciated that two princes of their ruling house were elevated to immortality. Their connection there was very ancient: a uniquely Spartan aniconic representation of the Tyndaridai was as two upright posts joined by a cross-bar; as the protectors of the Spartan army the "beam figure" or dókana was carried in front of the army on campaign. Sparta's unique dual kingship reflects the divine influence of the Dioscuri. When the Spartan army marched to war, one king remained behind at home, accompanied by one of the Twins. "In this way the real political order is secured in the realm of the Gods". Their herōon or grave-shrine was on a mountain top at Therapne across the Eurotas from Sparta, at a shrine known as the Meneláeion where Helen, Menelaus, Castor and Pollux were all said to be buried. Castor himself was also venerated in the region of Kastoria in northern Greece. They were commemorated both as gods on Olympus worthy of holocaust, and as deceased mortals in Hades, whose spirits had to be propitiated by libations. Lesser shrines to Castor, Pollux and Helen were also established at a number of other locations around Sparta. The pear tree was regarded by the Spartans as sacred to Castor and Pollux, and images of the twins were hung in its branches. The standard Spartan oath was to swear "by the two gods" (in Doric Greek: νά τώ θεὼ, ná tō theō, in the Dual number). The rite of theoxenia (θεοξενία), "god-entertaining", was particularly associated with Castor and Pollux. The two deities were summoned to a table laid with food, whether at individuals' own homes or in the public hearths or equivalent places controlled by states. They are sometimes shown arriving at a gallop over a food-laden table. Although such "table offerings" were a fairly common feature of Greek cult rituals, they were normally made in the shrines of the gods or heroes concerned. The domestic setting of the theoxenia was a characteristic distinction accorded to the Dioskouroi. The image of the twins attending a goddess are widespread[k] and link the Dioskouroi with the male societies of initiates under the aegis of the Anatolian Great Goddess and the great gods of Samothrace. The Dioscuri are the inventors of war dances, which characterize the Kuretes. The heavenly twins also appear in the Indo-European tradition as the effulgent Vedic brother-horsemen the Ashvins, the Lithuanian Ašvieniai, the Germanic Alcis., and the Venetic Alkomnoi of Este. From the fifth century BC onwards, the brothers were revered by the Romans, probably as the result of cultural transmission via the Greek colonies of Magna Graecia in southern Italy. An archaic Latin inscription of the sixth or fifth century BC found at Lavinium, which reads Castorei Podlouqueique qurois ("To Castor and Pollux, the Dioskouroi"), suggests a direct transmission from the Greeks; the word "qurois" is virtually a transliteration of the Greek word κούροις, while "Podlouquei" is effectively a transliteration of the Greek Πολυδεύκης. The construction of the Temple of Castor and Pollux, located in the Roman Forum at the heart of their city, was undertaken to fulfil a vow (votum) made by Aulus Postumius Albus Regillensis in gratitude at the Roman victory in the Battle of Lake Regillus in 495 BC. The establishing of the temple may also be a form of evocatio, the transferral of a tutelary deity from a defeated town to Rome, where cult would be offered in exchange for favor. According to legend, the twins fought at the head of the Roman army and subsequently brought news of the victory back to Rome. The Locrians of Magna Graecia had attributed their success at a legendary battle on the banks of the Sagras to the intervention of the Twins. The Roman legend may in fact have had its origins in the Locrian account and possibly supplies further evidence of cultural transmission between Rome and Magna Graecia. The Romans believed that the twins aided them on the battlefield. Their role as horsemen made them particularly attractive to the Roman equites and cavalry. Each year on July 15, the feast day of the Dioskouroi, the 1,800 equestrians would parade through the streets of Rome in an elaborate spectacle in which each rider wore full military attire and whatever decorations he had earned. Castor and Pollux are also represented in the Circus Maximus by the use of eggs as lap counters. In translations of comedies by Plautus, women generally swear by Castor, and men by Pollux; this is exemplified by the slave-woman character Staphyla in A Pot of Gold (act i, ll.67–71) where she swears by Castor in line 67, then the negative prefix in line 71 denotes a refutation against swearing by Pollux. The Etruscans venerated the twins as Kastur and Pultuce, collectively the tinas cliniiaras, "sons of Tinia," the Etruscan counterpart of Zeus. They were often portrayed on Etruscan mirrors. As was the fashion in Greece, they could also be portrayed symbolically; one example can be seen in the Tomb of the Funereal Bed at Tarquinia where a lectisternium for them is painted. They are symbolised in the painting by the presence of two pointed caps crowned with laurel, referring to the Phrygian caps they were often depicted wearing. Zeus, Hera, and Amor observe the birth of Helen and the Dioscuri (Dutch majolica, 1550). Even after the rise of Christianity, the Dioskouroi continued to be venerated. The fifth-century pope Gelasius I attested to the presence of a "cult of Castores" that the people did not want to abandon. In some instances, the twins appear to have simply been absorbed into a Christian framework; thus fourth-century AD pottery and carvings from North Africa depict the Dioskouroi alongside the Twelve Apostles, the Raising of Lazarus or with Saint Peter. The church took an ambivalent attitude, rejecting the immortality of the Dioskouroi but seeking to replace them with equivalent Christian pairs. Saints Peter and Paul were thus adopted in place of the Dioskouroi as patrons of travelers, and Saints Cosmas and Damian took over their function as healers. Some have also associated Saints Speusippus, Eleusippus, and Melapsippus with the Dioskouroi. The New Testament scholar Dennis MacDonald identifies Castor and Pollux as models for James son of Zebedee and his brother John in the Gospel of Mark. 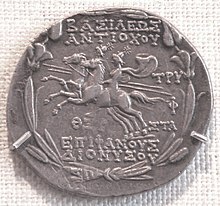 MacDonald cites the origin of this identification to 1913 when J. Rendel Harris published his work Boanerges, a Greek version probably of an Aramaic name meaning "Sons of Thunder", thunder being associated with Zeus, father of Pollux, in what MacDonald calls a form of early Christian Dioscurism. More directly, the Acts of the Apostles mentions the Dioskouroi in a neutral context, as the figurehead of an Alexandrian ship boarded by Paul in Malta (Acts 28:11). ^ /ˈkæstər/; Latin: Castōr; Greek: Κάστωρ Kástōr "beaver"
^ /ˌpɒlɪˈdjuːsiːz/; Greek: Πολυδεύκης Poludeúkēs "much sweet wine"
^ Phoebe ("the pure") is a familiar epithet of the moon, Selene; her twin's name Hilaeira ("the serene") is also a lunar attribute, their names "appropriate selectively to the new and the full moon". ^ In the oration of the Athenian peace emissary sent to Sparta in 69, according to Xenophon (Hellenica VI), it was asserted that "these three heroes were the first strangers upon whom this gift was bestowed." ^ Kerenyi draws attention especially to the rock carvings in the town of Akrai, Sicily. ^ a b c d Burkert 1985, p. 212. ^ a b Cotterell, Arthur (1997), "Dioscuri", A Dictionary of World Mythology, Oxford University Press . ^ Howatson, MC; Chilvers, Ian, eds. (1996), "Dioscūri", The Concise Oxford Companion to Classical Literature, Oxford University Press . ^ a b c Roberts, John, ed. (2007), "Dioscūri", Dictionary of the Classical World, Oxford: Oxford University Press . ^ a b c Parker, Robert Christopher Towneley (2003), "Dioscuri", in Hornblower, Simon; Spawforth, Anthony, The Oxford Classical Dictionary, Oxford University Press . 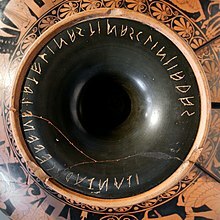 ^ of Mytilene, Alcæus (May 2011), "Fragment 34a", Toutcoule (World Wide Web log), Google . ^ Homer, Hymn, Theoi . ^ Campbell, David (1967), Greek Lyric Poetry, Bristol: Classical Press . ^ Kerenyi 1959, p. 109. ^ a b c d e f g h i j k l Stratikis, Potis (1987), Greek Mythology, B, pp. 20–23 . ^ a b c "Dioscuri." Encyclopædia Britannica. 2008. ^ Routledge (2002), "Castor and Polydeuces", Who's Who in Classical Mythology, London: Routledge . ^ Kerenyi, Karl (1967), Eleusis: Archetypal Image of Mother and Daughter, Princeton: Bollingen, p. 122 . ^ a b Kazhdan, Alexander; Talbot, Alice-Mary (1991), "Dioskouroi", in Kazhdan, Alexander P, The Oxford Dictionary of Byzantium, Oxford University Press . ^ Kerenyi 1959, p. 107 note 584. ^ Browning, W. R. F. (1997), "Dioscuri", A Dictionary of the Bible, Oxford University Press . ^ Kerenyi 1959, p. 107. ^ Sekunda, Nicholas "Nick" Victor; Hook, Richard (1998), The Spartan Army, Osprey Publishing, p. 53, ISBN 1-85532-659-0 . ^ Pomeroy, Sarah B (2002), Spartan Women, US: Oxford University Press, p. 114, ISBN 0-19-513067-7 . ^ Davenport, Guy (1999), Objects on a Table: Harmonious Disarray in Art and Literature, Basic Books, p. 63, ISBN 1-58243-035-7 . ^ Kerenyi 1959, p. 111. ^ Maier 1997, p. 96. ^ Beard, Mary; North, John; Price, Simon (1998), Religions of Rome, 1. A History, Cambridge University Press, p. 21, ISBN 0-521-45646-0 . ^ Smith, Christopher (2007), "The Religion of Archaic Rome", A Companion to Roman Religion, Blackwell, p. 37 . ^ Mommsen, Theodor (2004), The History of Rome, II, Kessinger Publishing, p. 191, ISBN 1-4191-6625-5 . ^ McDonnell, Myles Anthony (2006), Roman Manliness, Cambridge University Press, p. 187, ISBN 0-521-82788-4 . ^ Bonfante, Giuliano; Bonfante, Larissa (2002), The Etruscan Language, Manchester University Press, p. 204, ISBN 0-7190-5540-7 . ^ de Grummond, Nancy Thomson; Simon, Erika (2006), The Religion of the Etruscans, University of Texas Press, p. 60, ISBN 0-292-70687-1 . Wikimedia Commons has media related to Castor and Pollux. Burkert, Walter (1985), Greek Religion, Cambridge: Harvard University Press, pp. 212–13 . Kerényi, Karl (1959), The Heroes of the Greeks, Thames and Hundson, pp. 105–12 et passim . Maier, Bernhard (1997), Dictionary of Celtic Religion and Culture, Boydell & Brewer . Pindar, Tenth Nemean Ode . Ringleben, Joachim, "An Interpretation of the 10th Nemean Ode", Ars Disputandi, Douglas Hedley and Russell Manning, transl, archived from the original on 2013-04-14 . Pindar's themes of the unequal brothers and faithfulness and salvation, with the Christian parallels in the dual nature of Christ. Walker, Henry J. The Twin Horse Gods: The Dioskouroi in Mythologies of the Ancient World. London–NY: I.B. Tauris, 2015. "Dioskouroi", Ouranios, Theoi Project . Excerpts in English of classical sources. Wikisource has the text of the 1911 Encyclopædia Britannica article Castor and Pollux.